Silahkan klik tulisan atau gambar untuk lanjut membaca One Man’s Campaign for Justice Shakes Bosnian Serb Old Guard. WASHINGTON, LELEMUKU.COM - Milorad Dodik, president of Republika Srpska, the largely autonomous Serb-controlled mini-state within Bosnia and Herzegovina, told Davor Dragicevic he should stop mourning his 21-year-old son. After all he has another one, the Bosnian Serb leader advised last month during a local media interview. But the 55-year-old restaurant waiter has shrugged off the presidential advice and is refusing to remain quiet. He’s demanding to know how his son died, who killed him, and why. In the process he’s complicating the re-election plans of Dodik, who’s been in power since 2010 and advocates tauntingly that Republika Srpska should break away from Bosnia and declare itself an independent state, a move that would shatter the fragile multiethnic peace of the Balkans. On October 7 Serbs in Republika Srpska and Croats and Bosnian Muslims elsewhere in Bosnia will head to the polls to elect lawmakers to the state-level parliament as well as the presidents and legislatures of the two entities that make up the federation. 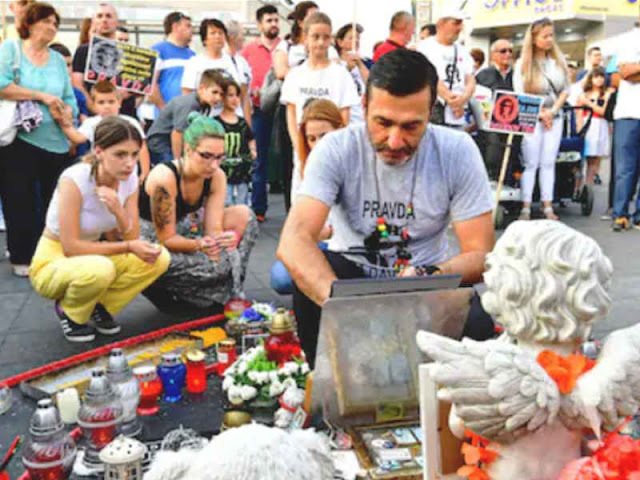 Since March 24, when his son David, an IT student, was discovered covered in mud and sand in a sewer at the confluence of two rivers six days after disappearing, Dragicevic has been mounting late night protests in downtown Banja Luka, Republika Srpska’s de facto capital. The protest vigils have attracted hundreds of supporters and a “Justice for David” Facebook group now has 325,000 members. A shrine to David has been left unmolested by the police, but overnight midweek the authorities installed CCTV cameras to observe the activity around it, and presumably to identify who attends the Justice for David rallies. “The fact that Dodik could say what he did, says more about him than me,” Dragicevic told VOA Wednesday. As he spoke in the strong afternoon sun, well-wishers, young and old, came up to shake his hand and urge him to stay strong. “The authorities have not answered any of my questions about my son’s murder,” Dragicevic said. He says he has proof corrupt police officers raped and murdered his son. “I am not afraid of them, even if they kill me, the truth needs to get out. Even if I had 1,000 children, each one of them would be important,” he added. David’s death has become a cause célèbre in Republika Srpska and has done more than any other agitation, or official reports from international bodies, to cast light on unexplained murders in the Serb-controlled enclave, on endemic corruption, and on the thuggish behavior of the police. In 2011, the Council of Europe, the leading human rights organization on the continent with 47 member states, criticized police misbehavior in Republika Srpska, saying detainees were being regularly abused. David Dragicevic regularly joined protests about police brutality and unexplained deaths. The initial coroner’s report said he’d committed suicide, despite the autopsy noting there were wounds suggesting he had been in a fight and his death was violent. The verdict was later changed to murder. Police officials claim he was on drugs, although no evidence has been presented. Dodik’s re-election remains highly probable, and he appears to be coasting to victory, but the Dragicevic affair has admitted some public light on the semi-autocracy the two-term president has shaped, according to Branislav Borenović, president of the opposition Party of Democratic Progress. Borenović chaired a legislative panel investigating how the police and government handled the Dragicevic case, which was staffed mainly by opposition lawmakers. “Dodik saw he had to do something as public interest in the case increased dramatically and he got scared and handed the hot political potato to us, hoping we would fumble it,” Borenović told VOA. “We were given just a month for the investigation; too little time, but it is the first time government officials have had to answer questions in a probe publicly. The police and prosecutors kept contradicting themselves when giving testimony, and we concluded he had been murdered,” he added. Opposition lawmakers are focusing much of their campaigning in the run-up to the October 7 elections on the issue of corruption. “Everything in the end is connected to corruption. How can people live in the country and stay in this country if they see there are people who can do whatever they want without any sanctions and without any penalties and are elected again and again,” he said. In an interview with VOA, Spiric denied the accusations, saying he saw them as Washington’s effort to interfere with the October elections. Whether Dodik is re-elected or not, Davor Dragicevic means to campaign and to get answers.